Mid-May. The football season has ended and thus betting opportunities are at a premium. However, there is still the Champions League Final to be contested! Atletico Madrid face off against Real in a Madrid derby that is sure to be close and unpredictable (if La Liga is anything to go by). Cup finals are also happening in England as well. Leyton Orient play Rotherham for a place in the Championship whilst Derby and QPR scrap for a place in the Premier League. Personally, I wouldn’t recommend betting on cup finals, so maybe only stick a few bob on the tasty treble that I have lined up. QPR had to go to extra time in order to win over semi-finalists Wigan, whilst Derby easily disposed of Brighton over two legs. The teams are evenly matched on head-to-head games as well, with the latest match between the two sides ending up 1-0 to the home team at Pride Park. With seven wins out of eight for Derby in all competitions, they are the favourites for this match. After both teams encountered stalemate in the first leg, Rotherham and Leyton Orient managed to claim wins in the second to set up this final. Expectations are high in South Yorkshire; Rotherham are aiming for a double promotion having automatically gone up from League Two last season. The season had started so well for Leyton Orient but tailed off later in the season, but they still managed to secure third place. This game seems guaranteed to have goals in it. The O’s have only kept one clean sheet in twelve games since mid March and Rotherham have conceded more goals than anyone in the top six (tied with Peterborough). 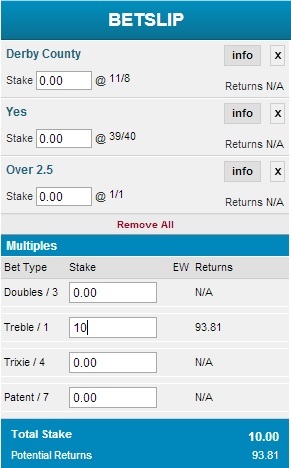 This treble has odds of over 8/1 with William Hill and BetVictor! Good luck.